The latest selection rate for master sergeants is the lowest in more than a decade. 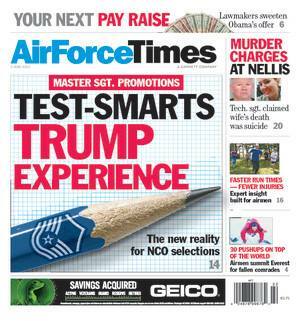 In this week’s Air Force Times, we look at what technical sergeants need to know to advance to master sergeant as the competition for promotion gets fiercer. You’ll also want to read this week’s story about a doctor has created an interactive course to help airmen reduce the chances of injury and shave time off the 1.5-mile run component of the PT test. Dr. Mark Cucuzzella developed the method after fine tuning his training around his injuries so that he could keep running. In the world of crime, a technical sergeant at Nellis Air Force Base, Nev., has been charged in the connection in the death of his wife, a staff sergeant. He initially told police she killed herself during an argument. And the number of cases of child maltreatment in the Air Force rose slightly in fiscal 2012. An Air Force official explains why case of neglect and emotional abuse are up. Meanwhile, Chief of Staff Gen. Mark Welsh says budget cuts have driven the Air Force over “the readiness cliff.” In a briefing with reporters, he talks about what worries him as the effects of budget cuts ripple through the service.